St. Patrick’s Day is quickly approaching, which means it’s time for some green and gold fun in preschool! 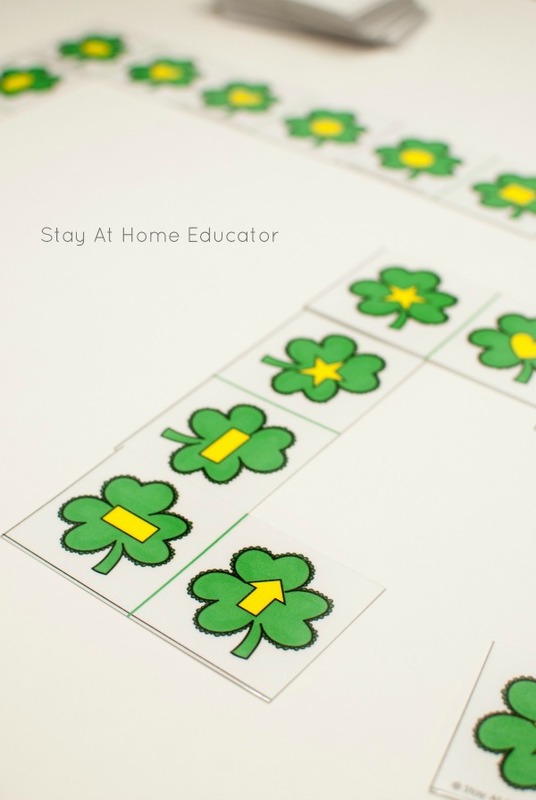 This St. Patrick’s Day printable is a game of shape matching dominoes. Be sure to grab your FREE printable at the end of this post. Dominoes is a fantastic game for preschoolers. Even very simple versions, like matching shapes, have many mathematical skills, and even literacy skills, too! Preschoolers learn to differentiate between shapes, which is a necessary skill in learning to write. Preschoolers learn to make matches, which is a skill in algebra. Once they learn to make matches, they can learn to identify and build patterns. 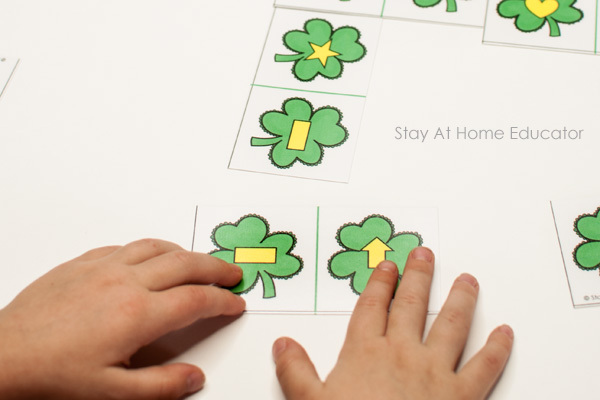 In this St. Patrick’s Day printable, they learn shape names. Working with dominoes, even printable versions, is a fine motor skill. This will be easy. The game is literally just a print and cut kind of game. You can laminate the cards if you want to use them over and over again, which I also do. 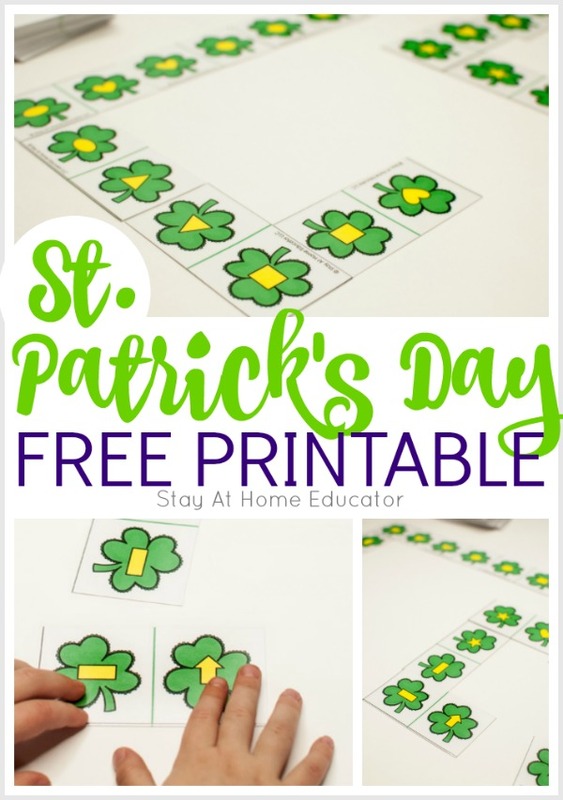 St. Patrick’s Day printable (Grab yours at the end of this post). Print the game on heavy card stock and cut along the black lines. DO NOT CUT the green lines. The green lines are the dividing lines between the two pictures on each card. Mix up the cards and stack them into a pile. Draw a single card and place it in the center of the play area. Because of the size of a game of dominoes like this one, I like to play on the floor. 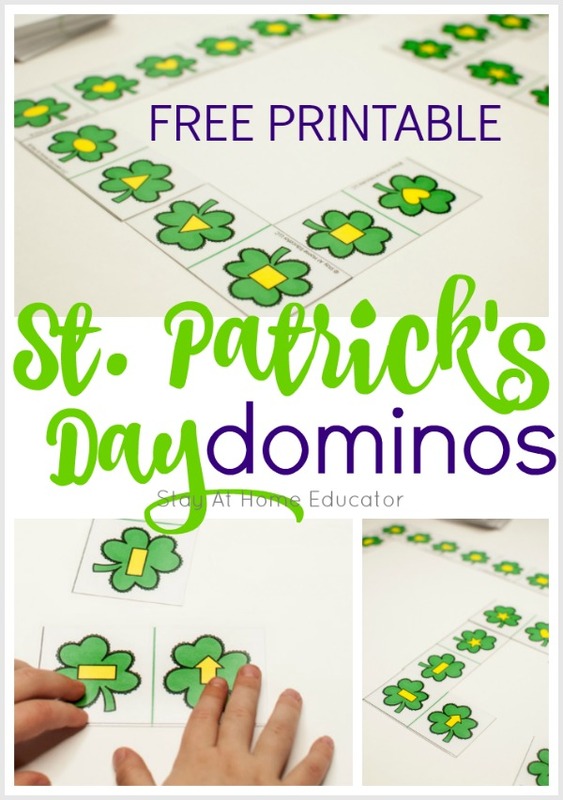 This St. Patrick’s Day printable has larger playing cards than a traditional dominoes tile game, so extra space is needed. I don’t know that I play the game the way traditional dominoes is played. My kids and I just match up the shapes. Sometimes, my kids make one giant long line that stretches the length of our kitchen. Sometimes it’s all turns and angles. It really doesn’t matter much. The point of the game is to identify shapes and make some matches! In the game set-up, you should have drawn a card to place in the center of the play area. Choose a player to go first, and draw a card. If the card has a matching shape, it is added to the cards already played. The player keeps the card for later use if it does not have a matching shape. If a player wants, they can turn the direction of a card by placing it sideways, thus giving more possible places to play upcoming cards. Before my kids draw a card on their turn, I ask them to look through their own cards to see if they can find a match. We keep the cards face-up so that I can help them. You can play that each player can play as many cards from their hand as possible in one turn or just one. Like I said, it’s not a complicated game, so you can make up your own house rules based on what is best for your own kids! Need this printable for your St. Patrick’s Day holiday? Or maybe you just want a copy to help your child learn their shape names? Grab your copy by clicking on the image below! 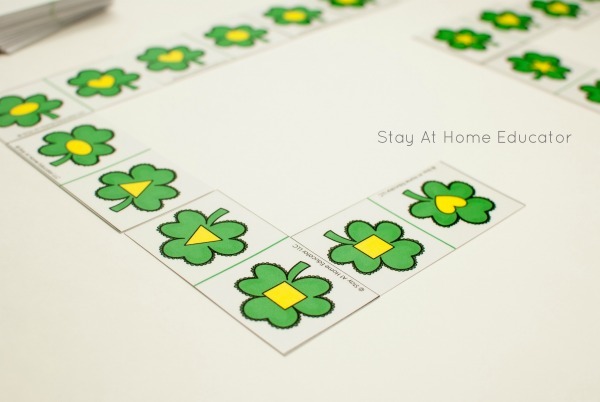 Need More St. Patrick’s Day Printables? 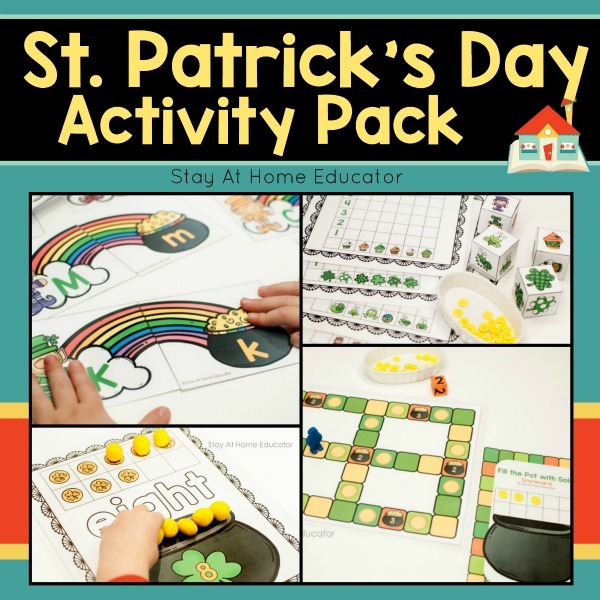 Then, this activity pack if just what you’re looking for! You can grab it right here, or at my Teacher’s Pay Teacher’s store. How fun!! Thank you for sharing. thanks so for the post.Really thank you! Great. Glad you like them, Delores. It”s amazing how important music is to kids, particularly preschoolers. You can see learning happening right before your eyes when rhythm, sound, and verse combine. Enjoy your grandson and your quilting!